A tender, sweet and funny novel from bestselling novelist Tess Evans. 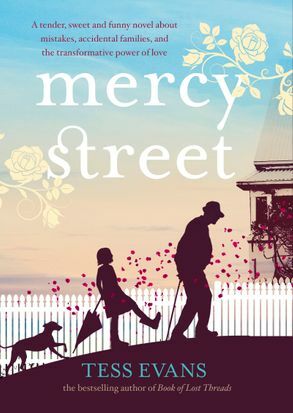 A delightful, sweet and funny novel from bestselling novelist Tess Evans, MERCY STREET tells the heartwarming story of curmudgeonly pensioner George, who, since his wife's death three years ago, is living a life that is no more than the sum of his 'worn-out, washed out days'. While his marriage to Pen was a happy one, they never had children, so his life has narrowed to trips to the shop, occasional visits from his bossy sister Shirl and afternoons in the pub with his old mate Redgum. But one day, everything changes when Angie, a nineteen-year-old single mother, unexpectedly saves his life. George grudgingly acknowledges his debt to her, and later, when Angie asks for a favour, he has no choice but to agree. Gradually George's life begins to blossom, until Angie's fecklessness unexpectedly sets him on the wrong side of the law. It takes all of his love and courage, and friends both old and new, for George to deal with a very unexpected turn of events. A novel about mistakes, accidental families, and the transformative power of love, from the bestselling author of BOOK OF LOST THREADS, Tess Evans. Tess Evans' first novel, the bestselling BOOK OF LOST THREADS, was published in 2010 and was shortlisted for the Indie Awards 2011 and longlisted for the 2012 International IMPAC DUBLIN Literary Award. She has since published THE MEMORY TREE (2012) and MERCY STREET (2016). Previous to her writing debut, Tess taught and counselled a wide range of people: youth at risk, migrants, Indigenous trainees, apprentices, sole parents and unemployed workers of all ages and professions. She lives in Melbourne.